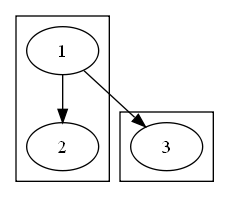 Using subgraphs to represent animation steps, rendered with Graphviz. current 09:31, 29 March 2009 229 × 197 (8 KB) Steeg.netcologne.de (Talk | contribs) Using subgraphs to represent animation steps, rendered with Graphviz. This page was last modified 09:31, 29 March 2009 by Fabian Steeg.